Since every company will claim they offer the best tactical knife you need to know what separates this utility from the ordinary knife. 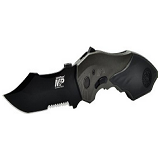 Generally, tactical knives have been specially designed for use in special tactical operations and missions. Although they can be used for fighting, these are not ordinary fighting knives as they are more versatile. 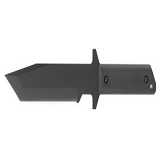 Some tactical knives have special tools like glass breakers built in so they are handy for use in an emergency (i.e., a downed aircraft). Tactical knives can also be used in S.E.R.E. (Survival-Escape-Resistance- Evasion) situations as well as search and rescue and extractions. In other words, these are designed for versatility and durability. The early tactical knives were large with hollow handles and more like a survival knife more than anything else. While popular they had flaws, not the least being structurally unsound. 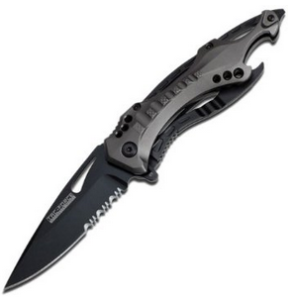 Modern tactical knives have overcome this by incorporating a longer tang, and in addition today’s tactical weapons are more durable, less likely to break at the interface between the handle and blade when torque is used. 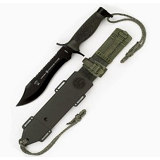 Most importantly, modern tactical knives are lightweight so it’s not a burden to carry around. There’s more to good tactical knives than just a sharp blade, as you also need to assess the material used to build the knife. However, your choice of material will depend on how you intend to use the utility. Tool and stainless steel are superior to the average material used in ordinary knives, but what you need to look for are blades that are resistant to corrosion damage and require little in the way of maintenance. Also, some alloys are brittle so you need to watch out for those. The handle has to be durable and yet ergonomic with a non-slip grip. It is important that you take the time to study the handle since it can affect the knife’s performance. All too often buyers just focus on the blade and ignore the handle, which should not be the case. The ideal tactical folding knife should have features that match your needs. For instance, if you’re going to use the knife to cut lines or rope, you should get a knife with full or partial serration as it will come in handy. In some tactical situations saw teeth on the blade spine is essential but it’s not as important as serration. 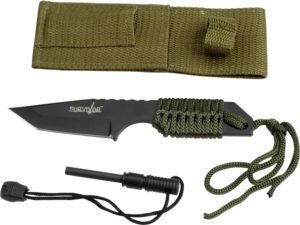 A lanyard opening at the pommel and lashing holes are ideal if you’re looking for a tactical / survival knife. In addition, a wire cutter will come in handy for soldiers and other special operatives. 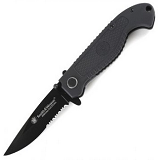 Knives like the Spyderco tactical knife is very popular because it’s portable, and for many people a knife’s weight is a big issue. Generally speaking, you don’t want to carry a knife that weighs more than two pounds, but don’t take this to an extreme because if you’re going to chop wood, a large knife will be necessary. However, all of these are for those who plan to use these knives. If you are buying these for your collection then the specifics won’t matter. But if you’re going to use your tactical boot knife try to stick to your needs and nothing more. Don’t get a knife with all the bells and whistles if you’re not going to use it since that will just complicate things. 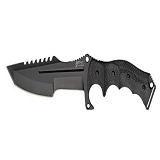 This knife has a 5.6″ handle with a 4.4″ carbon stainless steel blade, ideal for use in different situations, and easily comparable to the best tactical folding knife available. Besides its sharp blade, a glass breaker and safety belt cutter are included. 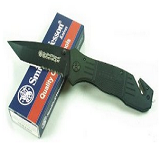 Thanks to its design the Smith & Wesson knife and handle is extremely solid yet light and durable. One of the nice things about the SWBG2TS is the blade, which opens easily and locks tight. In addition, the knife has a solid gripping material with finger grooves as well. The gripping material isn’t just well made, as the pocket clip is just as solid. 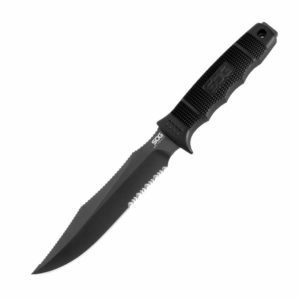 While it can be used as a fighting knife, the SWBG2TS is built for heavy duty use and perfect for responders. 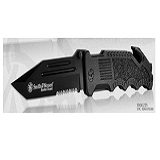 The built, weight, and feel is just right for tactical knives and in case of an emergency. Though it is suitable for anyone who needs an all-purpose knife, the SWBG2TS is particularly good for professionals, safety instructors and also firefighters and law enforcers. In short, this is appropriate for any activity that requires heavy duty knives. Unlike other fixed blade tactical knife utility tools out there, SOG Specialty Knives have an assortment of features that make it suitable for tactical missions. The SOG Specialty Knives comes with a spine tap, a long tang, deep finger grooves and an extra sharp blade. The knife is constructed from AUS-8 steel and comes in a beautiful TiNi finish. 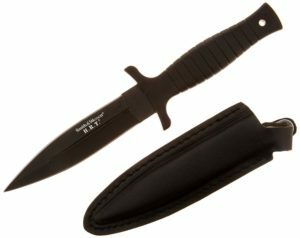 Part of the 7 inch blade is serrated and it has a clip point shape that gives you sharper, deeper and faster punctures. Most importantly, the blade sharpens quickly and won’t break off easily. Furthermore, the handle is well balanced and ergonomically contoured so you get a knife that is durable, impact resistant and can be held comfortably. Just like other SOG products, this knife has been subjected to SOG’s cryogenic heat treatment procedure. Given all its features, it is not surprising that they’re favored by the military. As these facts indicate, choosing the best tactical knife requires a lot of research and preparation. While it’s true there are a lot of tactical and fighting knives available, they’re not built equally and it’s easy to end up with the wrong one. By taking the time to study your options, you’re less likely to make a mistake when buying.